Coke — which, like the C.D.C., is based in Atlanta — has also had two employees on Georgia Shape’s advisory board, in various years. One was Rhona S. Applebaum, Coke’s chief science and health officer. She left the company in 2016 after The Times reported that she had helped orchestrate a strategy of funding scientists who encouraged the public to focus on exercise and worry less about how calories contribute to obesity. Ben Sheidler, a Coke spokesman, said that someone from the Georgia Department of Public Health had solicited the grant for Power Up for 30 from Coke’s foundation, but that he did not know who it was. The program emphasized Coke’s longtime contention that exercise is the key to weight loss. A search of the program’s website turned up no mention of the role of sugary drinks and sodas in weight gain. The company has spent millions on studies that support exercise over reducing soda consumption, and that, critics say, deflect attention from the role sugar-sweetened beverages have played in the soaring rate of obesity and the spread of Type 2 diabetes among children. Some details of the relationship between Dr. Fitzgerald and Coke were reported in earlier news accounts. After her new post was announced, U.S. Right to Know, a nonprofit research group that focuses on transparency in the food business, sent journalists links to the broadcast along with emails between Dr. Fitzgerald and Coke officials. Dr. Fitzgerald also said on the television show that Georgia Shape would push children to eat five servings of fruits and vegetables every day. Dr. Fitzgerald, 71, is an obstetrician-gynecologist and a Republican who has run for Congress twice, unsuccessfully. She has close ties to her fellow Georgia Republicans Tom Price, the secretary of health and human services, and Newt Gingrich, the former speaker of the House and an informal adviser to President Trump. She has won widespread praise in Georgia for her work to reduce infant mortality, encourage language development among babies, and nudge her state up in terms of student fitness. In a statement responding to questions, Dr. Fitzgerald defended the program and the relationship. 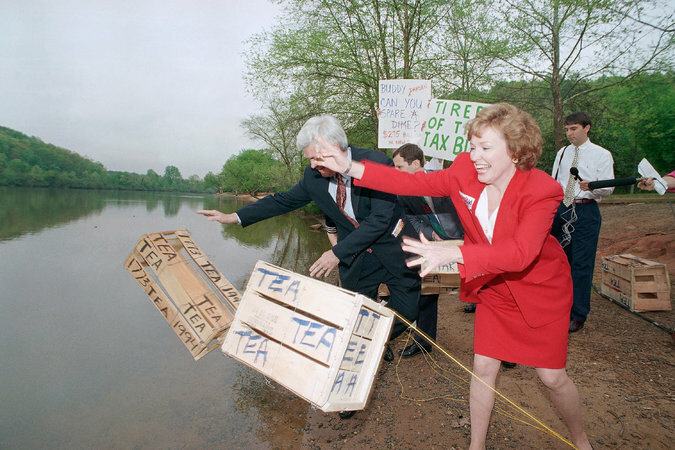 Dr. Brenda Fitzgerald and the former speaker of the House, Newt Gingrich, at a 1994 protest in Georgia against higher taxes and government spending. Dr. Fitzgerald was recently named the head of the C.D.C. Paul Howard, health policy director at the Manhattan Institute, a conservative think tank, said federal budget constraints had made donations from corporations like Coke a valuable option. But the growth of public-private partnerships, as they have come to be called, in the health field has raised ethics alarms among those who believe many corporate gifts are designed to help donors as much as recipients, by enhancing their reputations or promoting their legislative agendas. In 2011, for example, the C.D.C. Foundation was harshly criticized for accepting $60,000 from a company that did research for the pesticide industry to underwrite a project designed to prove that two agricultural chemicals were safe. Dr. Evelyn Johnson, who serves on Georgia Shape’s advisory board, said Coke had no influence over the program. She praised Dr. Fitzgerald for her efficiency and her impact on child health in Georgia. Coke has had a difficult relationship with the C.D.C. The company donated more than $1.1 million to the agency from 2010 to 2012 via the C.D.C. Foundation, a separate nonprofit entity created by Congress in 1995 to augment the agency’s budget for programs at home and abroad. The money was earmarked for several projects, some of which, like the Georgia program, were aimed at promoting exercise as a good solution to the nation’s rise in obesity. “Coke has a very strong presence in Atlanta and has been a good corporate citizen for many years,” said Dr. Thomas R. Frieden, who resigned as director of the C.D.C. at the end of the Obama administration, after eight years. But soon after Dr. Frieden took on the job, he started winding down Coke-funded programs. In June 2016, during Dr. Frieden’s tenure at the C.D.C., a top official, Barbara Bowman, director of the division for heart disease and stroke prevention, resigned after U.S. Right to Know revealed emails in which she appeared to advise Alex Malaspina, a Coke official, on dealing with the World Health Organization. Ursula Bauer, a C.D.C. official, wrote a memo to the staff saying that the two were old family friends, and noting that employees should be careful what they write in emails that may find their way to public view. Coke’s donations to other federal agencies continued. The company’s public records show it gave more than $1.75 million to the Foundation for the National Institutes of Health between 2010 and 2014, and nearly $2.7 million to the National Park Foundation between 2010 and 2016. But Dr. Frieden said that after he ended the Coke-funded C.D.C. health initiative, he approached the soft drink company with other programs in need of funds. He met with Dr. Applebaum and Muhtar Kent, the chief executive of Coke, but was unable to persuade the company to donate, other than about $20,000 that he recalls was linked to fighting the Ebola virus. “Look, let’s find some neutral space,” he recalled saying. Dr. Fitzgerald, asked if she’d accept donations again from Coke, replied in an email that it was possible, contingent on an assessment of potential conflicts of interest. An earlier version of this article misstated the amount of money Coca-Cola donated to the C.D.C. Foundation between 2010 and 2012. It was $1.1 million, not $1.4 million.